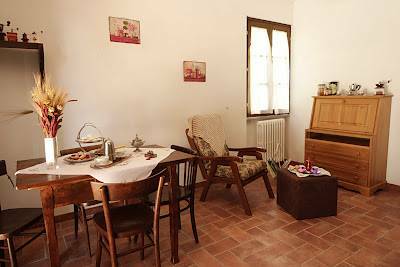 Our bed and breakfast is a charming structure located in the Tuscan countryside, in the magnificent triangle Arezzo-Siena-Firenze. The bed and breakfast has two large apartments, which can host 4 people each, for a total of eight beds. The apartment on the ground floor is the Coffee Room. The apartment is a studio with a double bed and a bunk bed, wardrobe, dining table. The kitchen was built on an old "madia", the rural furniture used for storing bread. The kitchenette is equipped with everything you need for cooking. The bathroom is private for the guests of the Coffee Room, it has a shower and is equipped with a hairdryer. 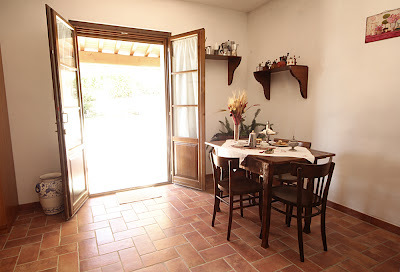 In front of the room stands a small veranda where you can enjoy breakfast offered by the family Piattelli. The apartment hosts Mrs. Marcella's collection of coffee machines . The first floor apartment is the Tea Room. The apartment is a studio with a double bed and two beds. The room has a kitchenette equipped with everything you need to cook: refrigerator, microwave, stove, pots and pans. The bathroom is private and reserved for guests, it has a shower and equipped with a hairdryer. The tea room opens onto a large terrace in which to enjoy a good bottle of Chianti while reading a book, watching the beautiful scenery. In the apartment you can enjoy a wide range of tea, the best quality. If you need it, you can add a cot for free. 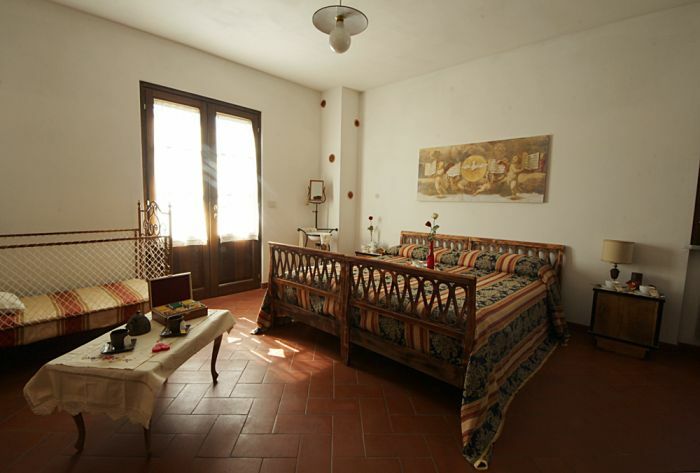 Around the bed and breakfast there is a large garden and olive grove, where you can enjoy the sun or a tasty barbecue. Pets are welcome and are allowed in the garden. The parking is free and adjacent to the bed and breakfast. La Pensionada has a magnificent position, where you can really enjoy a special panorama by reading a book in our olive grove or tasting a good Chianti in the terrace. In the Coffee Room you can admire the wonderful coffee machines collection of Ms Marcella and in the Tea Room you can taste aby type of tea of the best quality. The apartment on the ground floor is the Coffee Room. The apartment is a studio with a double bed and a bunk bed, wardrobe, dining table. The kitchen was built on an old "madia", the rural furniture used for storing bread. The kitchenette is equipped with everything you need for cooking. The bathroom is private for the guests of the Coffee Room, it has a shower and is equipped with a hairdryer. 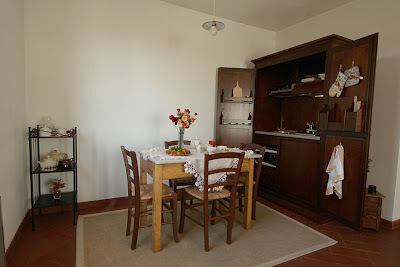 In front of the room stands a small veranda where you can enjoy breakfast offered by the family Piattelli. The apartment hosts Mrs. Marcella's collection of coffee machines. 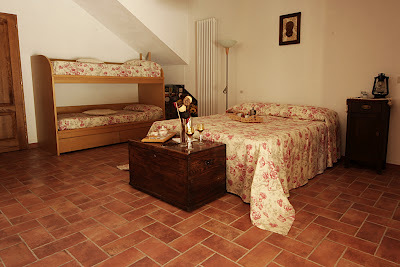 The bed and breakfast is situated near to the tuscan village Pergine Valdarno, in the tuscan countryside. The area is famous for the wineyards (there are a lot of farms around where you can learn how to make wine and also buy it) and for olive groves. It is situated in the wonderful triangle Arezzo-Firenze-Siena. 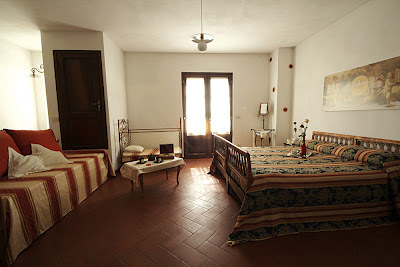 Situated just 200 meters far from La Pensionada, tipical Tuscan Food, special prices for clients. Situated 2 km far from La Pensionada, Pizza and revised tuscan food. Situated 4 km far from La Pensionada, Pizza and revised tuscan food. Prices may vary in reason of the number of guests inside each apartment. To reach "La Pensionada", take the motorway A1 (from the north direction Rome, from the south direction Florence) and take the exit marked "Valdarno". Then follow the directions to Pergine Valdarno. Once arrived in Poggio Bagnoli, turn right towards Pergine and then turn right again at the bus stop. The best way for coming is the car, but you can also choose to come by train or bus. If you want to come by train you have to arrive until Arezzo and rent a car; you can also arrive until Laterina and then ask for a transfer by calling us. If you want to come by bus, you can arrive at Poggio Bagnoli by taking the bus called Busitalia from Montevarchi or Arezzo.